Well, it had to happen soon enough. After the controversial discovery of similar hobbit-like skeletons from Micronesian Palau, a joint University of Oregon, North Carolina State Univerisity and Australian National University study published in PLOSone says that these skeleton weren’t hobbits but normal humans. Following the suggestion from last week’s controversial paper about the nature of the Flores Hobbits comes a new discovery that may argue that the Hobbits are just really small humans. Fossil remains found in the Micronesian island of Palau have displayed some similarities to the so-called homo floresiensis fossils found in 2004. The open-access study was published in the Public Library of Science journal, PLoS ONE. There’s apparently a National Geographic documentary about the skeletons to be released on March 17, but I don’t think it’ll be out in Asia. Newly discovered fossil assemblages of small bodied Homo sapiens from Palau, Micronesia possess characters thought to be taxonomically primitive for the genus Homo. 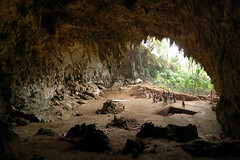 Recent surface collection and test excavation in limestone caves in the rock islands of Palau, Micronesia, has produced a sizeable sample of human skeletal remains dating roughly between 940-2890 cal ybp. Preliminary analysis indicates that this material is important for two reasons. First, individuals from the older time horizons are small in body size even relative to â€œpygmoidâ€ populations from Southeast Asia and Indonesia, and thus may represent a marked case of human insular dwarfism. Second, while possessing a number of derived features that align them with Homo sapiens, the human remains from Palau also exhibit several skeletal traits that are considered to be primitive for the genus Homo. These features may be previously unrecognized developmental correlates of small body size and, if so, they may have important implications for interpreting the taxonomic affinities of fossil specimens of Homo.